This post has been updated to be part of September’s Go Ahead Honey, It’s Gluten Free! This event was created by Naomi Devlin of Straight Into Bed Cakefree and Dried and is being hosted this month by Ali and Tom of Nourishing Meals. The theme of this month’s round-up is… IDEAS FOR PACKING A HEALTHY SCHOOL LUNCH! Yes. It is that time again. Summer vacation has come to an end. The routine-less days are now filled with structure and schedules. The lazy pajama-filled mornings are now replaced with rushed outfit changes and mismatched socks. Four course breakfasts lasting all morning are now replaced with meals that have to pack a big punch in a fast way (says the woman who dubs herself the “Breakfast Seargent” – I have strict rules about what is going to be fueling their brains until lunchtime). I am a solid believer in the amazing power of nutrition and its’ hold over the function of the rapidly growing, neuron firing child’s brain. Great nutrition is essential to good education and learning potential. In order for the brain to function optimally, it needs a hearty supply of healthy fats, proteins, carbohydrates, water, vitamins, and minerals. When children are missing these essential nutrients from their diets, they tend to be less curious, less attentive, less active, and more anxious. These deficiencies can lead to cognitive impairment and delayed learning capabilities. And as we again face those frenzied mornings that signal that school is back in session, it is a wonderful time for us to take stock of what we are using to fuel our children’s brains. By sending them off to school with breakfasts and lunches that are full of nutrient dense foods packed with the proteins and amino acids that will keep those neurons firing long into the afternoons, we are fostering amazing learning potentials. However, in the rush of the mornings, we often lose sight of what the best options are to pack in that healthy punch. Convenience can trump healthy. Here are some easy ideas to help overcome those mental blocks that we can face during the hectic spin of the mornings. The ideas below are all geared towards the gluten-free and allergy-friendly lunchbox – the list may seem long, but I wanted you to really see how many options there are for those of us with dietary restrictions. I will soon be doing a similar post full of breakfast ideas as well. These are the Lunchbots – Stainless Steel Lunch Containers that I send in my son’s lunch box everyday. I LOVE THEM! Note: These ideas focus on Gluten-Free, Dairy-Free, Egg-Free, Nut-Free choices. You must ALWAYS read labels and ensure that your allergens are not included in any ingredients. Manufacturers can change their ingredients at any time. Something that you may have once considered safe, may no longer be so. Also, any food may cause an allergy, not just the most common ones, so please always take your necessary precautions to keep your meals safe. Note: Any of these ideas can be put on gluten free bread (Udi’s is our favorite), gluten-free pita bread (GFL Foods, Inc is our favorite), gluten free tortillas or wraps (Sandwich Petals are delicious), gluten free crackers, gluten free bagels (again Udi’s are our favorites, hands down), or even home-made gluten-free whole-grain or grain-free pancakes (like these from Elana’s Pantry) and waffles (like these from The Spunky Coconut). Just have fun, think outside the box, and mix and match your sandwich fillings/toppings with what you put them on. 1. Try out different nut butters topped with fruit slices (instead of your typical PB&J) on any of the above. If your child’s school is nut-free, try Sunflower Seed or Soy Butter (I always sprinkle a little chia seed or flax meal inside my kids nut-butter sandwiches for a little extra omega goodness). 4. Organic Nitrate-Free turkey slices (such as Applegate Farms – only kind of lunchmeat I buy), Avocado slices, Roasted Peppers, Dairy or Vegan Cheese slices inside a gluten-free pita, in a sandwich, in a wrap, or on a bagel. 7. Chicken (or tuna) salad: in a pita, on a sandwich, or on a bagel – Try a mixture of leftover chicken or tuna (or a gluten-free rotisserie chicken), diced celery, diced apples, cut grapes, a tiny bit of organic mayonnaise (or use Egg-Free mayonnaise), a squeeze of lemon, salt and pepper to taste. 9. Black Bean burgers with avocado slices on a sandwich or gluten free bun (like these from Lexie’s Kitchen). 10. Shredded veggies mixed with cream cheese and spread on bagels or wraps. 13. Gluten Free Granola in a container with a separate thermos of Dairy or Dairy-Free milk to pour over it. 5. Dates with Cream Cheese, Dairy or Vegan. Sounds weird but so yummy! Try to mix and match your choices each day, throw in a note or a joke to put a smile on your child’s face, and arm yourself with some fun eco-friendly reusable lunch containers. You really cannot go wrong with filling their lunch boxes with whole grain, plant based options, and avoiding the highly processed, nutrient void convenience foods. Have fun with your creations and then sit back and know that you have done a major part in fostering your child’s learning potential. And for more amazing school lunch ideas and recipes, go download the FREE E-cookbook, put together by Alisa Fleming of Go Dairy Free and One Frugal Foodie. Smart School Time Recipes: The Breakfast, Snack, and Lunchbox Cookbook for Healthy Kids and Adults is full of wonderful healthy recipes from many bloggers. What are you going to be packing in lunchboxes this year? Any ideas to add to this list? 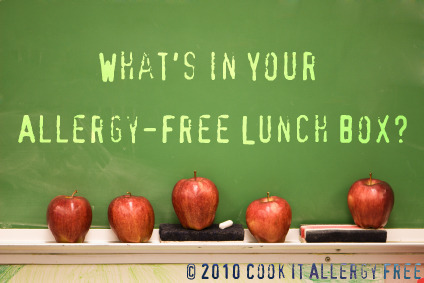 We can all add to this and turn it into a Master Lunch Box List for the Allergy-Free crowd, of sorts! What great ideas! I’ve never thought of trying dipping apple or pear slices in pumpkin pie filling but now I want to, it sounds delish! I’m working on more recipes that are lunchbox friendly and that I will be presenting in the weeks to come, so that Master Lunchbox idea sounds perfect. Thanks, Zoe! I have to remind myself of some of these when I get into my ruts, but the kids always love when I change things up! If you have any recipes/ideas you want to add to the list, let me know. I will add them with your links! ps The pumpkin pie dip is super yummy and my kids think it is dessert! Another dynamite post! You are doing a great service to so many busy moms and dads! Love the sandwich on a stick idea. Ah, thanks Lexie! I just tried out the sandwich on the stick today with Conner for lunch. He said he loved it and all of his friends could not stop asking about it. I hope this helps at least a few moms and dads. Even i get stumped in the mornings when we are rushing to get out of the door. Had to remind myself of a few of these that i have used in the past and then forgot about. Shirley, I LOVE Family Fun magazine. I have gotten so many recipes and craft ideas from it over the years! And I loved Ali’s post about having the kids help with packing healthy lunches. My boys go to a Montessori school where they encourage the parents to make sure that the kids are helping with everything at home! My boys help me make lunches, cook, do laundry, empty dishwashers, make beds… I could go on. But it is such a wonderful way for them to build confidence and let them feel like they are part of the family dynamics! They actually both love doing all of it (not sure what they will feel about it as they turn into teenagers though, lol). WOW~! What an amazing post! I’ll definitely have to use this as a resource for quick lunches, this will be so helfpul to so many people! Awesome job girl! Carrie, thanks so much! Even I need reminders though to think outside the box… part of the reason I wrote this post! And these are ideas for adults too. Hubby actually likes a lot of these ideas as well. He gets so tired of going out for lunch everyday. He has 3 partners and ALL of them are gluten free for different reasons (one’s son has autism, one’s wife has Celiac Disease, one has Crohn’s, and my hubby has Celiacs). So he has a lot of support at the office and they always go out and eat together or one of the wives send food for them for lunch! Kim, you read my mind. These are great not just for kids, but adults also. Awesome list! THANK YOU!!! School starts in 1 week and I’m stuck for ideas. I found this and it’s getting me some great starts. I’m in Canada and we don’t have the best of selection here but these are great ideas. I signed up to receive your emails. Hi Tracy! I am so glad that you find the ideas helpful. No matter what, we all seem to get stuck for ideas from time-to-time. So some extra tips can always be useful! Thank you so much for your comments and for signing up to receive my posts!!! 😉 Welcome to Cook It Allergy Free! I love this list! Far too good for the kids. ;-). Have started to chronicle the gluten free lunchboxes that I’ve been making on my blog since school began last week. Am grateful for the inspiration! Awesome blog! Nicola. I am glad you liked my lunch ideas! I will have to go check out your lunchbox chronicles on your blog. I, too, look for more inspiration always! It is so fun to get ideas from other gfree moms!